“Fleets don’t just manage freight, they also manage data.” That was one of the keynote messages from Tom McLeod, founder of McLeod Software at the company’s User Conference in Birmingham, Alabama. Carriers and shippers have weathered a lot of change over the last three decades since the first version of the McLeod software rolled out. There are more electronics in the truck; computers and cell phones are more powerful and portable; there are more government regulations and data from all aspects of the business are being centralized and shared for complete visibility into operations. Where is the next drop-and-hook location? How can I reduce dwell times and detention billing? What is my individual trailer utilization? Which group of trailers should be scheduled for preventative maintenance? 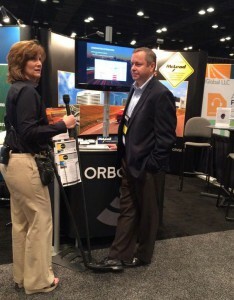 At the show, ORBCOMM announced its two-way communications capabilities with McLeod LoadMaster software. This new functionality allows customers to have command and control capabilities over their refrigerated trailers, including the ability to turn the reefer on/off, set temperatures and switch between continuous and start/stop modes. All in an effort to increase asset utilization, enhance customer service and proactively prevent spoilage cargo claims. A big thank you to the McLeod Software team for hosting an action-packed conference! We look forward to our continued relationship. Next up we will be at the 2015 ATA Management Conference & Exhibition in Philadelphia, October 17 -20. Schedule a Meeting and visit us at Booth 716 to learn more about our recent integrations with TMS software providers, our new mobile app and how to measure the ROI for your asset management solutions.